Finally the great man is being recognized by the Catholic Church! It is wonderful to hear that someone who has contributed to society as much as this caring individual, and everyone’s favorite giant. He charmed us all with his role as Fezzik in the Princess Bride and miraculously held the WWF Champion belt in the same year that he died. Let’s Drage the Stadium Thing On and On and On? I was very excited when Hamilton was announced as the venue for the Athletics (track and field) portion of the Pan American Games. Many years ago I represented Canada at the Pan Am Juniors in Barquisimeto Venezuela. I recently volunteered for the entire month of February at the 2010 Olympic Games in Vancouver (most of the pictures in the right column are from that trip). I was amazed that Hamilton had scored something so near and dear to my heart. I began taking Spanish lessons right away, with the goal of volunteering for Pan Am athletics in 2015. The stadium was always supposed to be in the west harbour. It was written in the Toronto Pan Am bid book well before 2010. The “location beside the railway tracks” has been publicly labelled as stadium territory a long ways back. In a tragic turn of events the stadium location became bogged down in local politics and Hamilton missed the deadline set by the Toronto (official host city), and lost the crown jewel of the Pan Am games. It is unimaginable. It now appears that the stadium itself is in jeopardy as the Feds and Queen’s park will not fund a tenant-less stadium. The Tiger Cats have made it clear that they will not be going to a stadium in the west harbour. It makes sense because cats don’t really like water. City council promptly voted for the harbour site, and now the Ti Cats are planning to leave Hamilton. The stadium plan will leave with them. I will declare that I have a potential conflict of interest here. 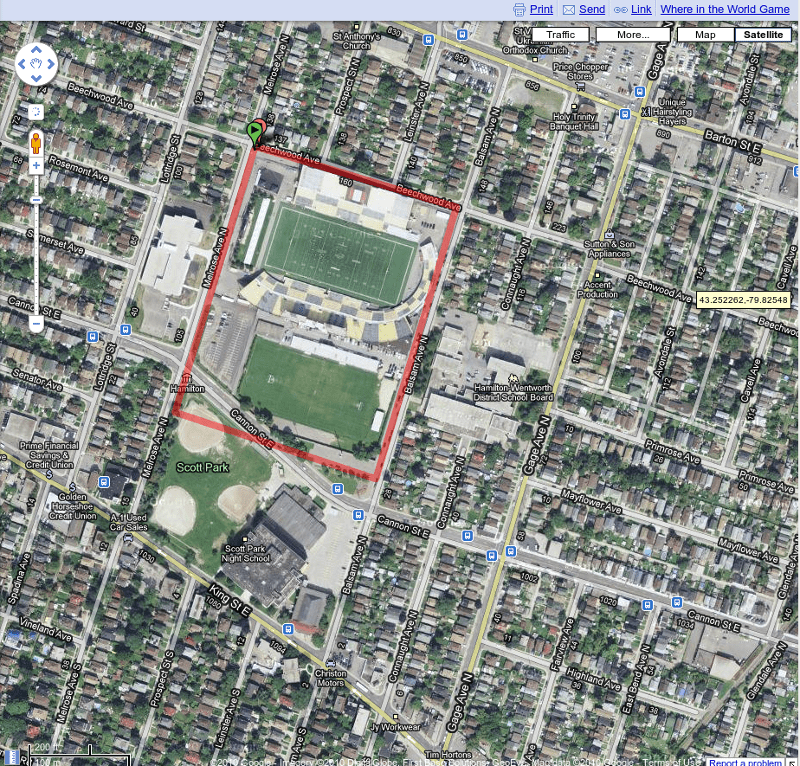 My family owns three properties on Dundurn street within walking distance of the my proposed stadium. One of those properties is The Staircase Cafe Theatre. The Tiger Cats play a sport called Canadian Football. A few Canadians watch this sport, but no one plays it recreationally. The ten home games each season will make no difference to The Staircase. If we were to fill The Staircase every Ti Cat game, that would be a mere ten times per year. There are 355 other days of the year to lose money. The city has wanted to put a stadium where the rail yard is for a long time. Those hopes were dashed when CN sold the yards to someone other than the city. So now the city has to make do with a stadium beside the railway tracks for a long time. The cities choice is a 40 acre parcel of land close to the harbour, but it is really beside a busy train yard. Resident’s private homes will need to be expropriated. Commercial property will need to be purchased. Some dirty land will be reclaimed. 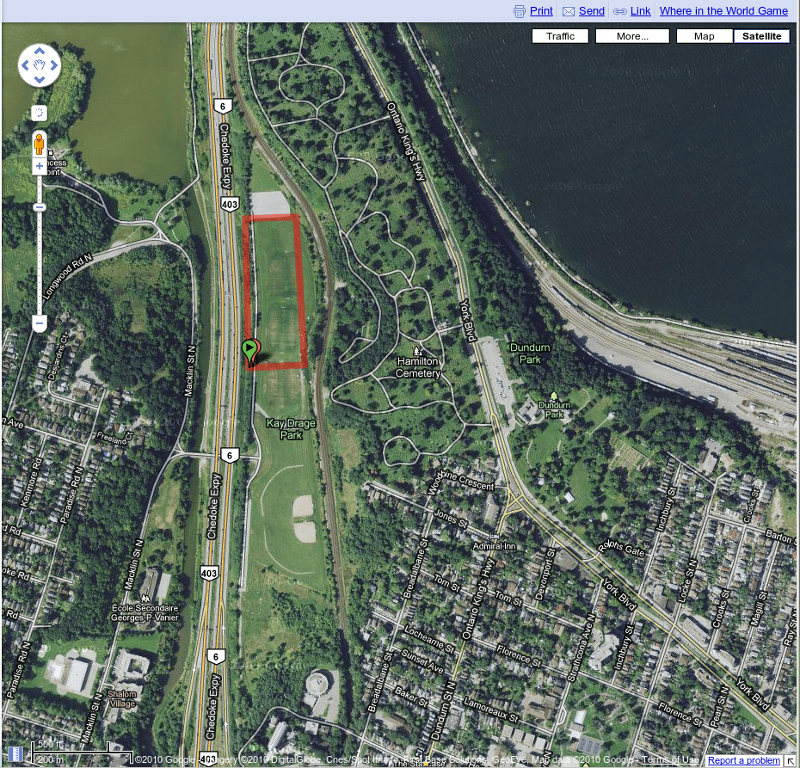 The closest proposed light rail stop may be as far as one kilometer away. Buses can go there for sure. Go transit cannot have a stop at this location. There is NO parking. The benefits and drawbacks have been discussed ad nauseum. The key point is that the Tiger Cats won’t go there, and therefore higher levels of government will not fund this location. 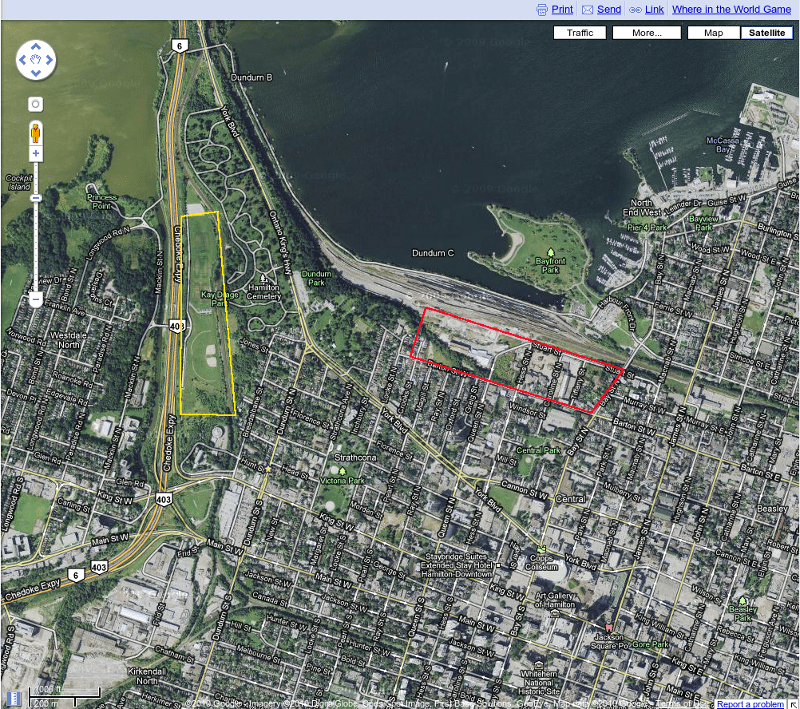 The only potential tenant for the proposed stadium plays in the 80 year old Ivor Wynne Stadium. Ivor Wynne is quite ironically a Commonwealth games legacy stadium. 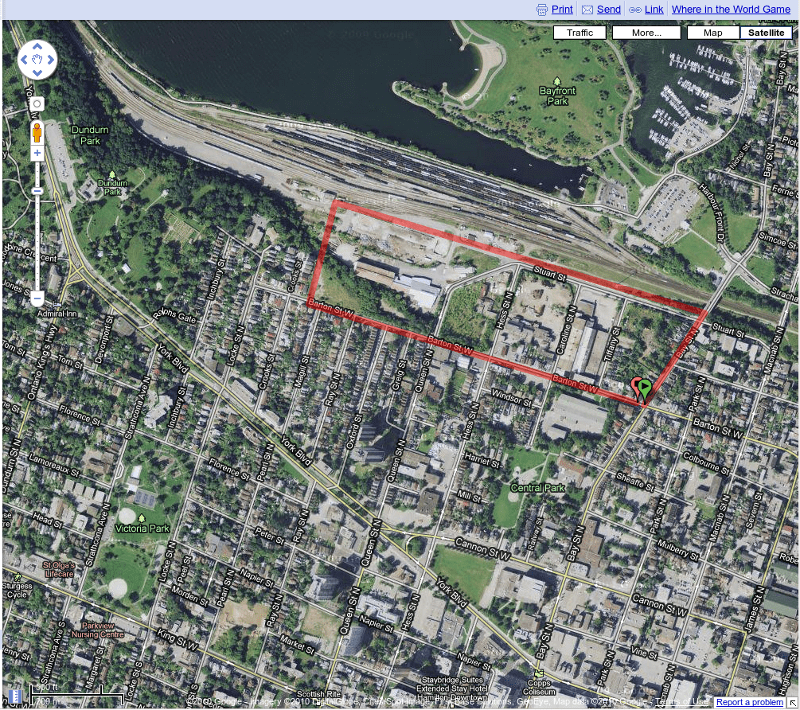 Ivor Wynne is on the bus route and proposed light rail line, has NO parking, and is no where near a GO transit line. The only tenant is losing money hand over fist at this location (or is it because no one plays or watches Canadian Football?). The city funds this location to the tune of at least $120000 per Tiger Cats game. Meow. Ivor Wynne 15 acres (stadium and practise field). No land needs to be expropriated. No land needs to be purchased. Quick walk from proposed rapid transit. GO Train stop right beside the stadium is possible. Build over rail tracks to increase space and improve local living conditions. It is near many bus routes. 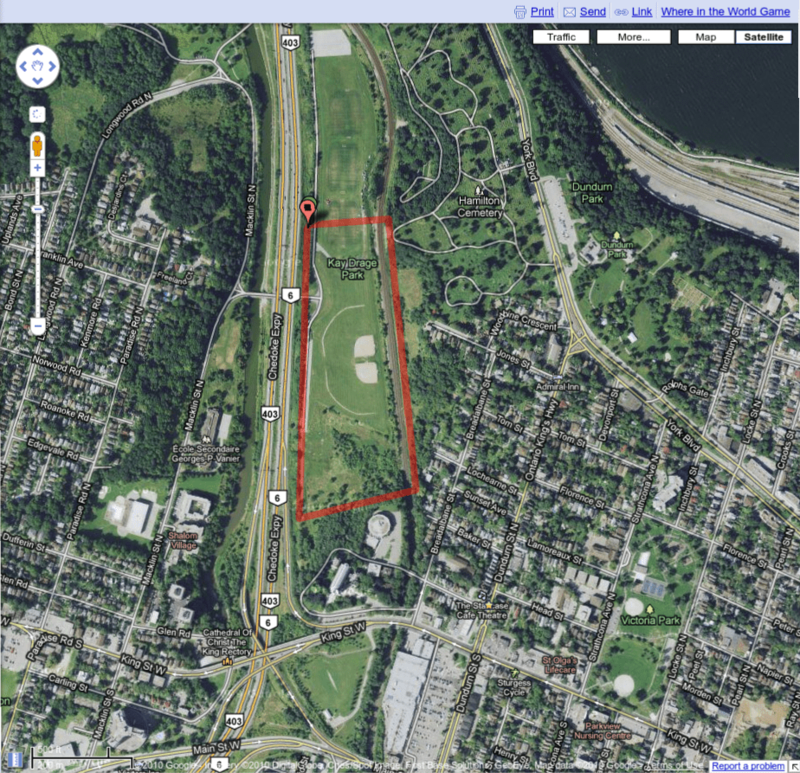 403 highway access is possible. Proposed stadia Kay Drage Park (yellow) Railway (red). Additional 1000 parking spots here (9 acres). This will be a true legacy stadium. With a GO station and plenty of parking the location will be used every day of the year, instead a of a mere ten times per year by an arcane sports franchise that may not survive the rise of the MLS. P.S. I am not a Bob Young basher at all. I am a happy Linux user and am forever grateful for what Mr. Young and Red Hat Linux have done for the open source community. Author hughPosted on August 21, 2010 Categories Bad Parking, End Game, Medical, Photos, Sports, Uncategorized, WTF2 Comments on Let’s Drage the Stadium Thing On and On and On? The last concert I went to see was TMBG at CBGBs in NYC, and that was more than 15 years ago. My dear friend Anne is a screaming Beatles fan, and when she found out that Sir Paul was playing mostly Beatles songs at the ACC she has to go. So Jamie, Anne and I made it into to TO via car and GO. Got lost looking for the arena (how do you hide an arena?). And saw a really fun and possibly sincere concert from an aging music icon. I was really impressed by Sir Paul’s charisma and slightly Parkinsonian dance moves. We had backstage seats which were really fun because I got to watch all the roadies running around. I am not as passionate about music as others. So normally I would NOT have gone to such a concert. Something that played a role in me going to see Sir Paul was a chance meeting a fellow named Doug. He showed up at The Staircase the morning of the concert. At this point I had not decided whether to go or not. Doug had travelled from London ON on a pilgrimage of sorts. He had seen a lovely video by Jacob Moon that was shot on the roof of The Staircase last year. 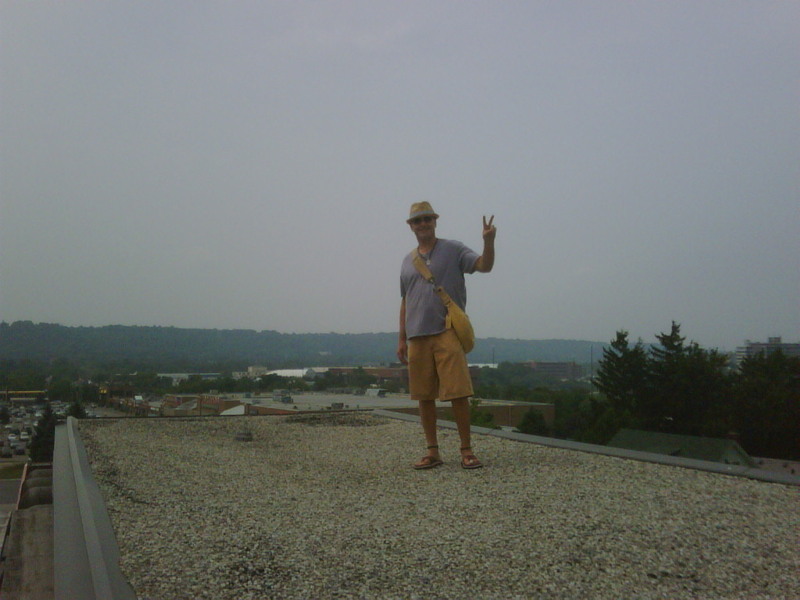 Doug wanted to stand on the roof where the video was shot because he had found the video and song so compelling. Jamie and I took him up to the highest roof where he looked out over west Hamilton and talked about how the song had affected him. 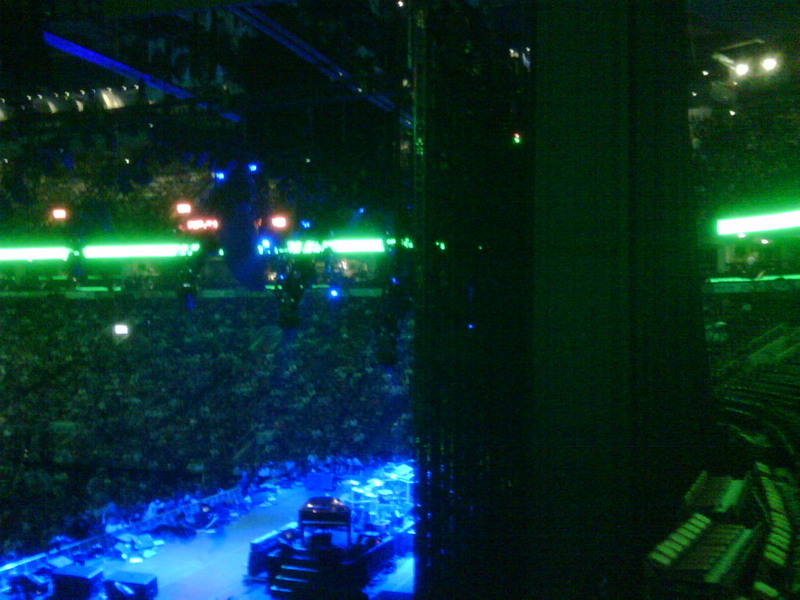 So I went to see Sir Paul on a whim, thanks to Anne and Doug, and had an amazing experience. Shockingly our governing humans are agitating to make a law that will actually benefit common folk. There is a move a foot to force all cell phone companies in Canada to unlock the cell phone you paid for if you choose to leave the company. Rogers is the worst offender of this egregious form of coercion. Unlocking cell phones is one of the most important tools that Canadians have to create some level of competition between the non-competitive cellular giants. You can get more info here. I will post more when I find out more. Here is more. Well It Looks Like …. 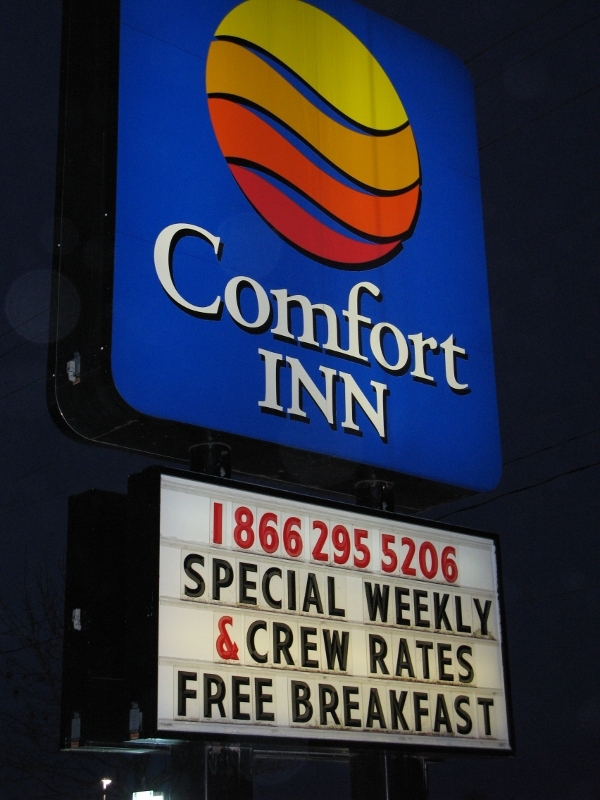 Well it looks like you get a free breakfast if you are paying for weekly screw rates to me. Author hughPosted on June 7, 2010 Categories Uncategorized1 Comment on Well It Looks Like …. I loved the movie Avatar. I found this lovely outline of the movie on the intertubes.